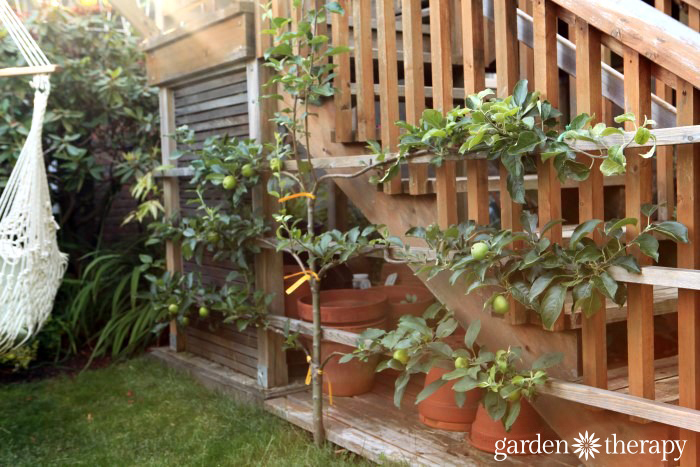 Growing espalier fruit trees in the home garden is a wonderful way to grow edibles in small spaces and in decorative ways. Training and pruning fruit trees to grow along walls or fences keeps the fruit at an easily accessible height, and turns an otherwise standard tree into a garden showpiece. 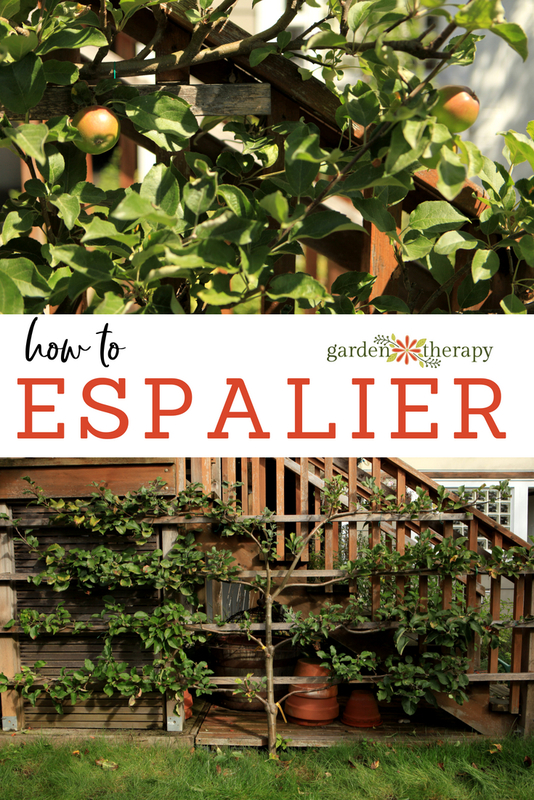 Espaliers can be fruit trees or ornamental, evergreen or deciduous. This article will cover how to create and maintain an espaliered fruit tree using pruning. Espalier is an art that originated in Europe. 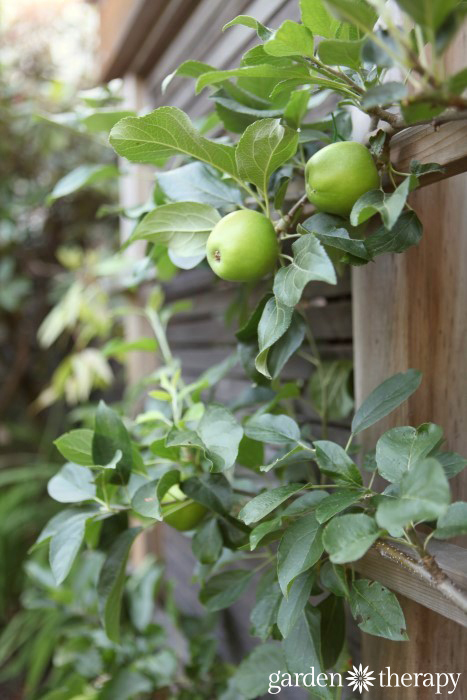 The skill of espalier involves patience and artistry you can see through as these plants are painstakingly trained along fences and walls. Touring around Europe, you will see elaborate and beautiful designs that have grown over hundreds of years. In the home garden this can be a fun project that grows over time with your family and evolves as the years go by. There are many different shapes of an espalier: cordon (branches straight out to the sides), fan (branches fanning up and to the side), candelabra (like a cordon but the branches turn at a right angle to form the shape of a candelabra), lattice (multiple trees with crossing branches), and “Y” shapes. The simplest shape to start with is the cordon. Often fruit trees can be purchased grafted into this shape like the espalier that I have in my play garden. My espalier has five different varieties of apple grafted onto a dwarf apple stock. Grafting is the process of attaching a branch to the tree so that they grow together as one. Since it’s the trunk of the tree that supports the rootstock, it determines the overall height of the tree. Then the branches of five different apples trees are grafted on to produce varied fruiting branches. I have even seen “fruit salad” trees with grafted branches of apple, pear, plum, peach, and cherry; although I can’t report on how well this works myself. 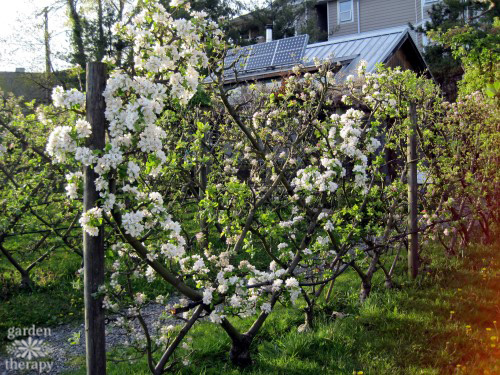 I have worked with a few espaliers in small urban spaces: grafted five-fruit varieties of apple and pear in my home gardens, and heirloom apples at the community gardens. 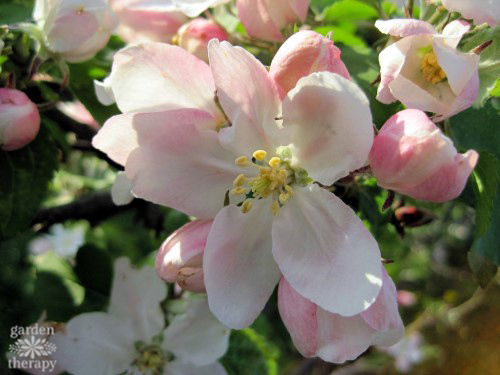 In my home garden, I have the space for only one tree, so I chose a tree with different varieties of apples that flower and fruit at varying times throughout the season. Usually the varieties are selected to support each other so that cross-pollination can occur, but sometimes grafting is simply for the novelty of having multiple fruit varieties on one tree. In practice, these grafted trees often start out with multiple varieties but then morph into one or two of the strongest varieties over time. 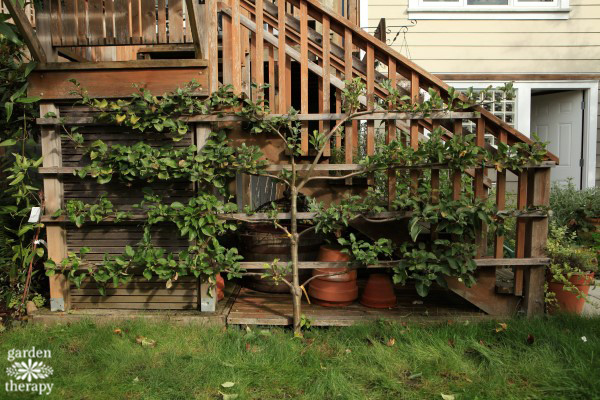 Even so, with the proper conditions and care, an espalier fruit tree can thrive and be productive in a small space. 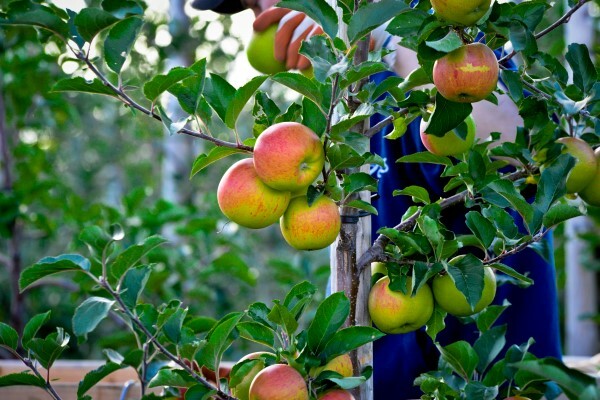 The optimal time to plant any fruit trees is in the winter or early spring when they’re dormant. Dig the tree into the soil as soon as the soil is workable for the year. Create a large hole that is twice as wide, but just as deep as your root ball. Add well-rotted compost to the hole. Position the tree so that the base of the trunk, at the root flare (just where it begins to widen), is at the soil line. Plant any deeper and the roots will grow upwards, plant too high and roots will be exposed. Fill in the hole with soil and water well for the first year until established. Don’t forget to pick the right place for your tree. 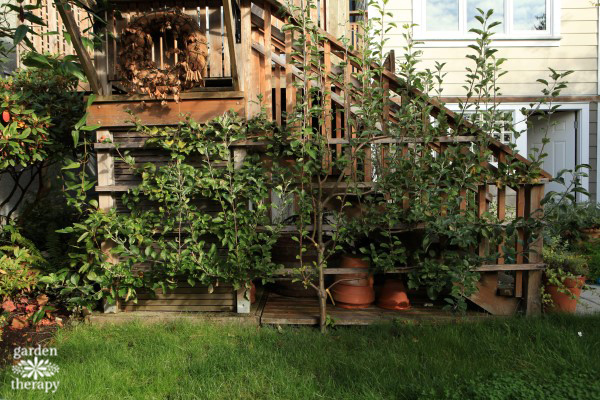 Most fruit trees love sun, so a nice sunny spot will give you the best fruit. Follow the care instructions on your tree for best results. First, determine the pattern you want and look for a young tree that has that basic shape. Remove any branches that don’t fit the pattern or that suffer from one of the 4 D’s (read all about that in Pruning 101). Now build a structure to support the shape, or attach the branches to an existing fence. Use a soft, covered wire or ribbon that can be retied when the branches grow. Be sure not to choke the branches with too-tight ties. 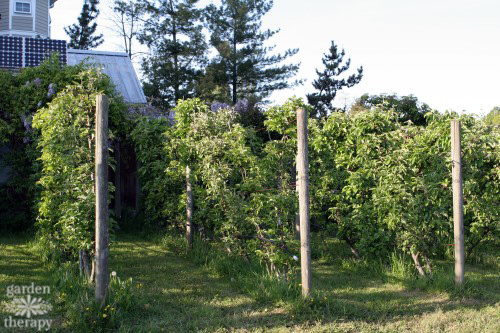 Monthly pruning will keep an espalier neat and productive. The key is to regularly do a little pruning to maintain the shape, and allow all of the tree’s energy to go into the remaining branches (read all about plant energy in this post on pruning). Remove any branches that are starting to get long, and leave plenty of buds where the cuts are. This will ensure that leaves, flowers, and fruit grow close to the branches. 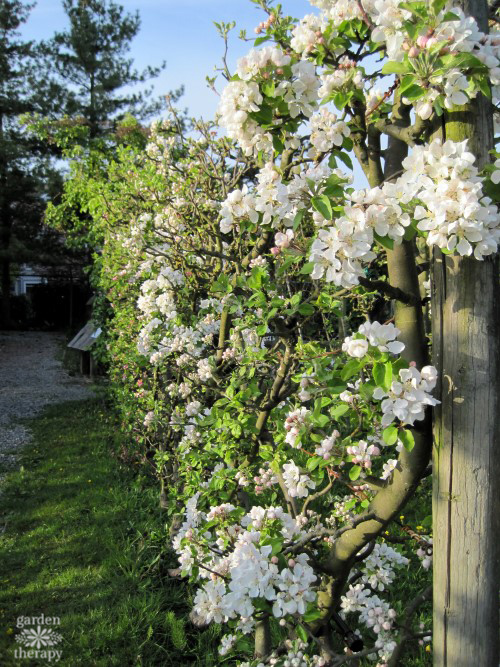 Continue to prune throughout the growing season and enjoy your gorgeous new espalier as it grows and fruits over the years. Thank you for the health full tips with diagrams to explain it. This article would have been a good read but the pop up advertisements took up 75% of the screen.